Marco Laucelli is a professional with more than 10 years of experience in IT Innovation and New Business development. Currently founder and CEO of Novelti, a Spanish startup focused on real-time analytics for IoT networks. Previously to launch Novelti, Marco has been working in IBM for seven year as IT Strategy and Innovation Consultant, being responsible of the IBM Global Entrepreneur program in South Europe. 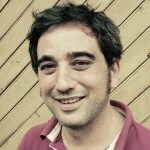 Marco holds a PhD in Theoretical Physics from the University of Oviedo (Spain) and the CERN. Marco has a large technical experience in distributed computing, cloud and data analytics, being actively involved in previous ventures – grid computing – and in solution design – service oriented architectures, data analytics in smart cities – for small and large companies.